What It Is: MOLTON BROWN The Bathing Treasures Collection - $50 @ barneys.com. What I Like It: How many times are you out shopping for those on your list and you come away with half of your purchases for yourself? For me, it’s too many times to count, so this year, I thought I would just go ahead and give myself permission for something. I mean, how cute is this set of travel-sized shower gels? It’s a beautiful red box of 12 – 1.5oz bottles in the following scents: Pink Pepperpod , Gingerlily, Orange & Bergamot, Eucalyptus, Coco & Sandalwood, Japanese Orange, Samphire, Suma Ginseng, Black Peppercorn, Ylang-Ylang, Templetree, and Silver Birch. Stick with one scent all week or try a different one each day. 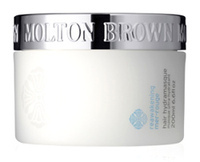 The beauty industry is always turning us onto new ingredients in the fight in aging and this MOLTON BROWN hand cream does just that with its Polynesian Kopara Anti-Ageing Hand Crème - Night-Time Remedy ($48/2.5oz @ neimanmarcus.com). Ok, so what is Polynesian Kopara and why the heck is it in this hand cream? It’s an extract of kopara exopolysaccharide, which they claims is against age-accelerating pollutants. It’s high in red algae, nutmeg, daisy and apple and will improve the skin on the back of your hand’s tone, firmness and smoothness. And they did a study with 30 women and they found that in 56 days 43.3% found an increase in the skin’s firmness. Hmmm, not to high of a percentage, I don’t think, but hey, what else are you using on your hands at night? Yes, that’s right, as the name states, this one is to be used at night before hitting the hay and probably the best time to use anything that has to really sit on the skin to work correctly. Not only is this one non-greasy but it has a nice delicate smell to it. For best results, I would use a body scrub for the backs of hands before applying to take off the dead skin cells. Are you in need of some back-of-the-hands TLC? "Hair, Hair, Flow It, Show It ..."
MOLTON BROWN just came out with a new HairTreat collection just in time for the Holidays. Since I am such a sucker for a good hair mask, I automatically gravitated towards the Reawakening Mer-Rouge Hair Hydramasque ($30/6.6oz). It bathed hair in amino acids, vitamins and dulse sea extracts. I don't think my hair could have taken one more day of wind or the tugging and pulling of styling. So just 15 minutes and my hair is back to normal. Do something nice for your strands today. There's also a Depth Charge Seednoir Prewash Hair-Therapy ($30/3.3oz) and Shining Starbloom Haircondition & Detangle ($20/6.6oz) in the collection. All @ moltonbrown.com.